General Circulation Models (GCMs) are advanced tools for impact assessment and climate change studies. Previous studies show that the performance of the GCMs in simulating climate variables varies significantly over different regions. This study intends to evaluate the performance of the Coupled Model Intercomparison Project phase 5 (CMIP5) GCMs in simulating temperature and precipitation over Iran. Simulations from 37 GCMs and observations from the Climatic Research Unit (CRU) were obtained for the period of 1901–2005. Six measures of performance including mean bias, root mean square error (RMSE), Nash-Sutcliffe efficiency (NSE), linear correlation coefficient (r), Kolmogorov-Smirnov statistic (KS), Sen’s slope estimator, and the Taylor diagram are used for the evaluation. GCMs are ranked based on each statistic at seasonal and annual time scales. Results show that most GCMs perform reasonably well in simulating the annual and seasonal temperature over Iran. The majority of the GCMs have a poor skill to simulate precipitation, particularly at seasonal scale. Based on the results, the best GCMs to represent temperature and precipitation simulations over Iran are the CMCC-CMS (Euro-Mediterranean Center on Climate Change) and the MRI-CGCM3 (Meteorological Research Institute), respectively. The results are valuable for climate and hydrometeorological studies and can help water resources planners and managers to choose the proper GCM based on their criteria. 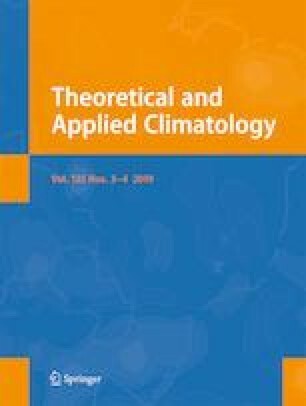 The authors would like to thank the CMIP5 climate modeling groups (Table 1) and the Climatic Research (CRU) from the University of East Anglia for making their products publicly available. We recognize the UNESCO Chair in Water and Environment Management for Sustainable Cities, Sharif University of Technology for the help in this work. We are thankful to the reviewer whose comments and suggestions improved the paper.